IN EVERY institution, not only are there rules that need to be observed and followed but also rights that must be upheld to have an orderly atmosphere. Regardless of position, every person is entitled to these rights that protect them from any mistreatment. However, in the University, a ratified students’ rights code that Thomasians can refer to does not exist. First drafted in October 2004, the Students’ Rights Code is still benching for the administration’s approval at present. With the constant delays, what have the student leaders and different colleges of UST been doing to ensure that the rights of Thomasians are protected despite the lack of a students’ rights code? The Students’ Code, originally named the Magna Carta for Students’ Rights, was first drafted by the Central Student Council (CSC) and the Central Board in 2004. After a series of revisions in the same year, former rector Rev. Fr. Ernesto Arceo, O.P. was ready to sign the Students’ Code, but resigned before doing so due to the dispute on the P3 billion UST Hospital expansion. In 2010, the Students’ Code again reached the Rector’s desk, but the then rector Rev. Fr. Rolando de la Rosa, O.P. did not sign it, saying that his term was about to end and it would be better for the next rector to sign the document. Six years after, in January, the Students’ Code reached the Office of the Vice Rector for Academic Affairs but was then returned to CSC by then Director Clarita Carillo because of technical revisions. Carillo also sent the student council a request for revisions on course requirements, make-up classes, grade computations, expression of research findings, and qualification of thesis advisers in March. Now, the Students’ Code is back to the early stage. The document is in the process of review by Faculty Regents, whose comments will then be gathered by the Central Board. After the Central Board consolidates all of the regents’ comments, Thomasians will have to vote on the passage of the Students’ Code, CSC Secretary Therese Gorospe said. 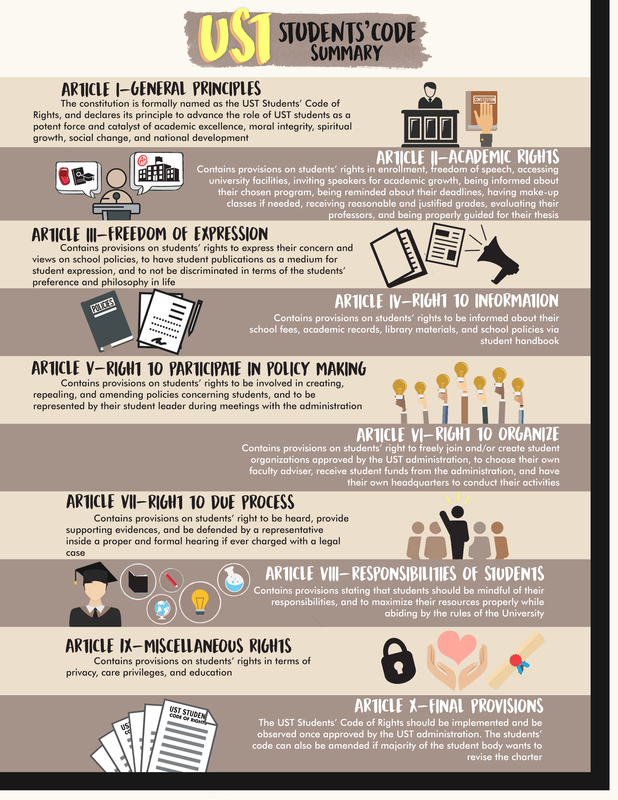 In the Faculty of Arts and Letters (AB), some steps have been taken to establish a concrete students’ rights charter, especially that there have been concerns on the “unclear” Bill of Rights (Article IV) of the AB Student Council (ABSC) Constitution. Board of Majors (BOM) Speaker Neal Tayco noted that there is insufficiency in Article IV, which covers Artlets’ voting rights and rights to information, grievances, and due process. “There are only six provisions in this article, and obvious naman siguro’ pag sinabi nating these six provisions, they don’t deal with specificities [..]. Insufficient siya,” Tayco said. Out of the “Big Four” universities, only the University of the Philippines Diliman (UPD) and UST do not have a students’ rights charter. Benjie Allen Aquino, president of the UPD University Student Council, claimed that the absence of a Magna Carta in the University would only lead to student oppression. He said that what UPD has is a Code of Students’ Conduct, which only enumerates the violations and corresponding punishment for students. “Not having a document that protects students’ rights will mean that the students will have a very weak defense against all injustices,” Aquino told the Flame. Similar to AB, UPD only has students’ rights charters in its local colleges. Meanwhile, Denise Marañon, president of the Ateneo de Manila University (ADMU) Sanggunian, said the student council plans to review ADMU’s decade-old Magna Carta despite having a university-wide students’ charter. Marañon added that students’ rights must be a concern for school administrations as there are inherent power dynamics found between administrators and students. The Magna Carta mediates these powers and ensures what is just and unjust to parties involved. In the local scene, as Thomasians continue to wait for their Students’ Code, Santos said college-based student councils in the University have created their own grievance machineries to address complaints from students. Despite this, Santos still aspires for the ratification of the Students’ Code so that Thomasians would gain a better and concrete understanding of their rights. “Outlining our rights in paper will effectively establish a legal, direct, and immediate basis for possible violations that may be committed against us. When we clearly know our rights, then we will be more likely to assert it,” he said. Recently, a Constitutional Convention (ConCon) began in AB for the purpose of addressing and updating concerns on the ABSC Constitution. It was attended by block representatives who raised suggestions for amendments. The ConCon will have three reading sessions, and the block representatives and BOM will discuss the proposed amendments in each reading until a polished, revised Constitution is passed at the end of the third hearing. Until there is a ratified students’ rights charter in UST, Thomasians could only resort to thinking how the Students’ Code could be a big breakthrough in the history of the University. PrevOf Brotherhood, Bruises, and Blood: What’s next after Atio’s death by hazing?